I went to Pam Lawson‘s for a printmaking class today. 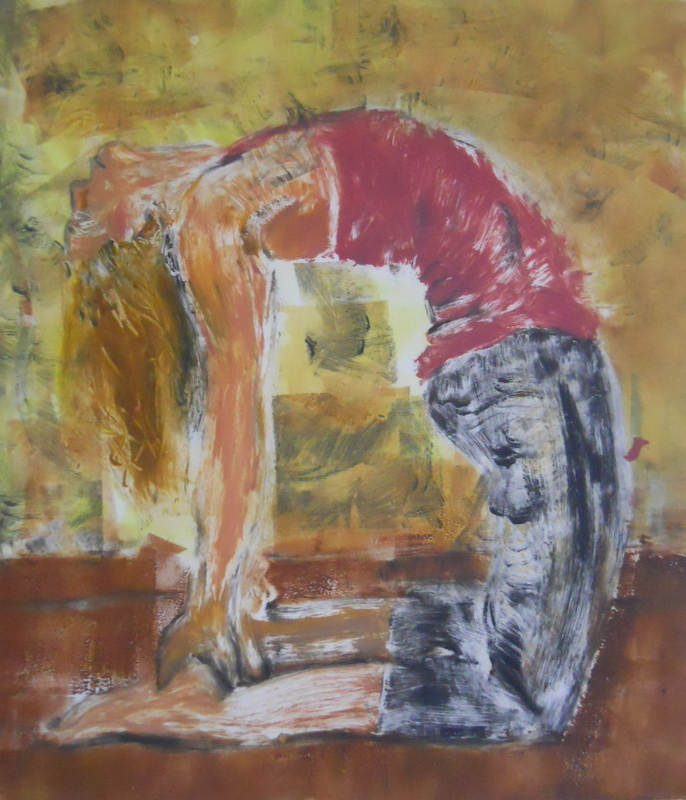 It is an informal monotype class, a small group with lots of individual instruction. I’m free to work on my ideas with the help of someone who knows what she’s doing and the added benefit of a press and lots of rollers. With a big roller, you can ink up a plate with a pattern on it and transfer the pattern on top of a 2nd image, which is what I did below. After the first one I used the ghost impression left on the plate as a guideline to make a new, more abstract version. Mostly I wanted to get the hang of using the big roller. In the first one the roller a jumped a bit, you can see it if you look at the bottom edge. I’m going to try next time with a darker ink in the background, probably an indigo or a deep violet, and a lighter figure, to see if I can get more contrast. 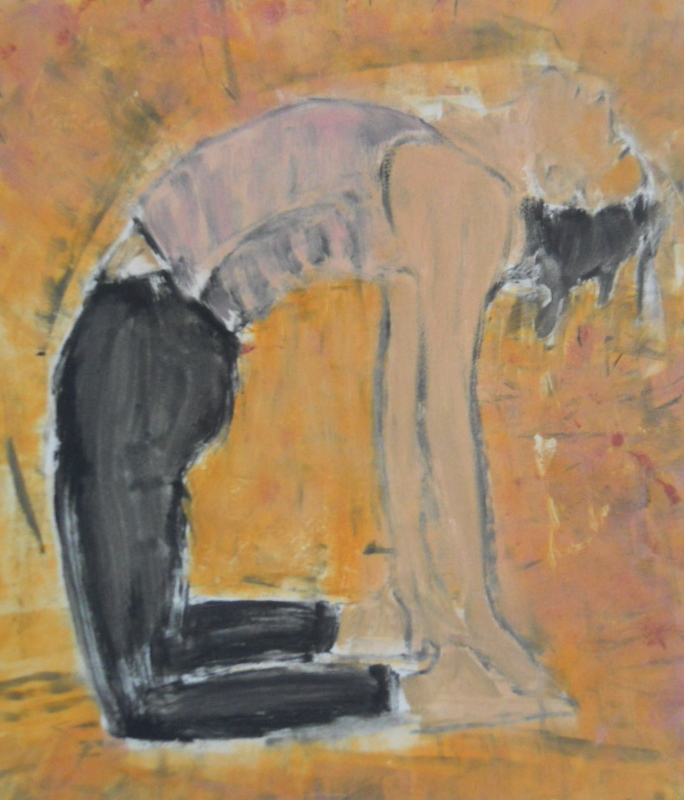 The model is Peg Mulqueen, in Laguvajrasana. 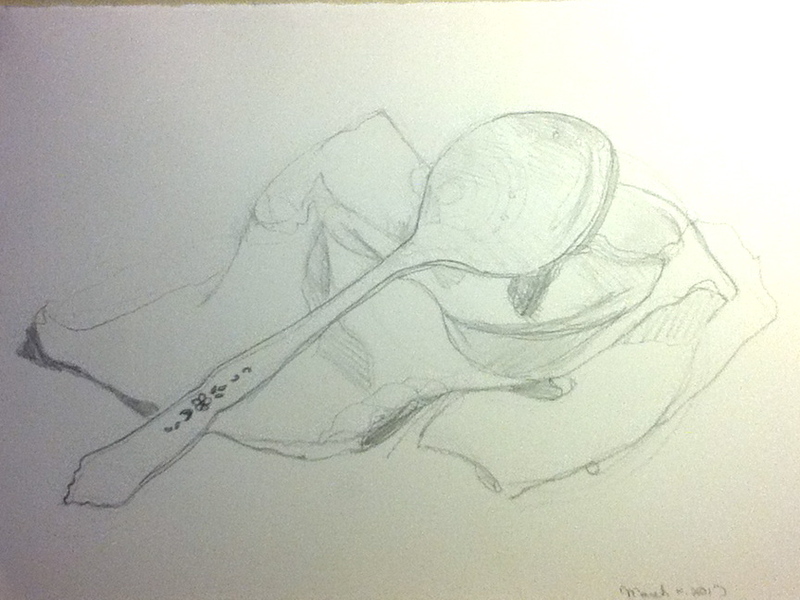 The spoon and napkin here is from daily drawing practice. Daily drawing is more of a goal than a reality, but I keep coming back to it. This is Ursula, in Ustrasana, the camel pose. 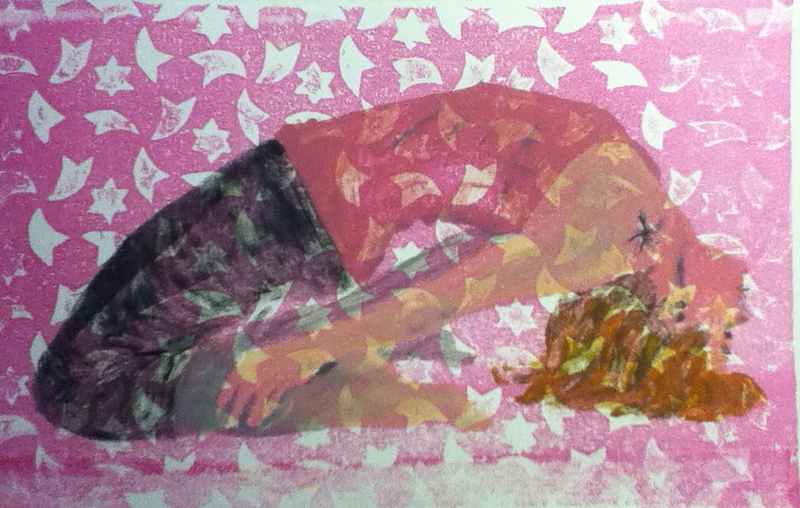 I’m taking some sessions with printmaker Pam Lawson. It is a joy to have access to a press and the wisdom of an experienced printmaker to go along with it. That night I told my husband the bad news, I’m going to need a press. He says fine, stop fooling around and let’s fix up our house and sell it, and then I can have a press and maybe a space of my own to work. The problem with that is that I’m up against time constraints. When I start fixing up the interior of our house, that’s going to eat up my studio time, at least for a while. Same pose, Peg Mulqueen this time. There is so much potential here, I want to work with multiple plates, layering the figures in their yoga poses against Islamic tile patterns. Meanwhile, Ellen Olson-Brown reminded me to get back to daily drawing, and I’ve been doing more or less that for a few weeks now. Here are a few sketches. The handle is a bugger, let me tell you. 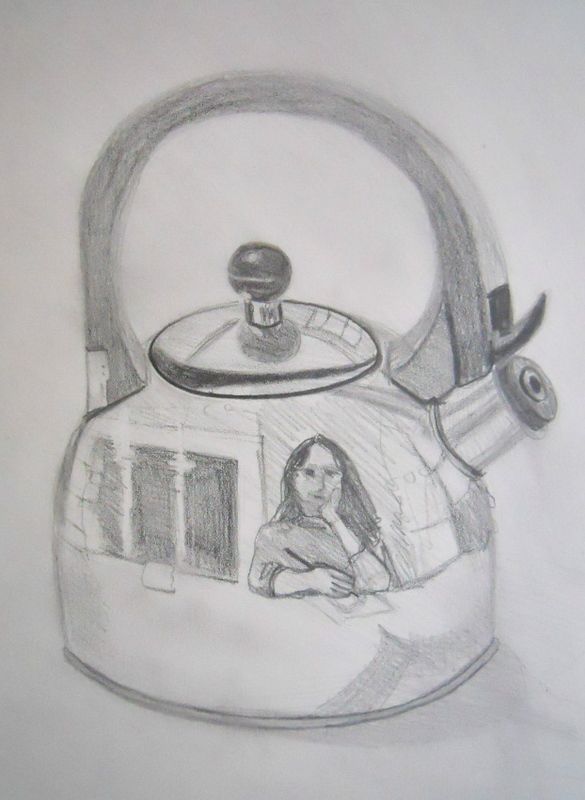 What’s nagging me about the prints above top is the hands, I’m not drawing them terribly well and they need to be good, so once the teapot is done I’ll practice drawing the yoga poses for a bit, and try to get those hand positions down. 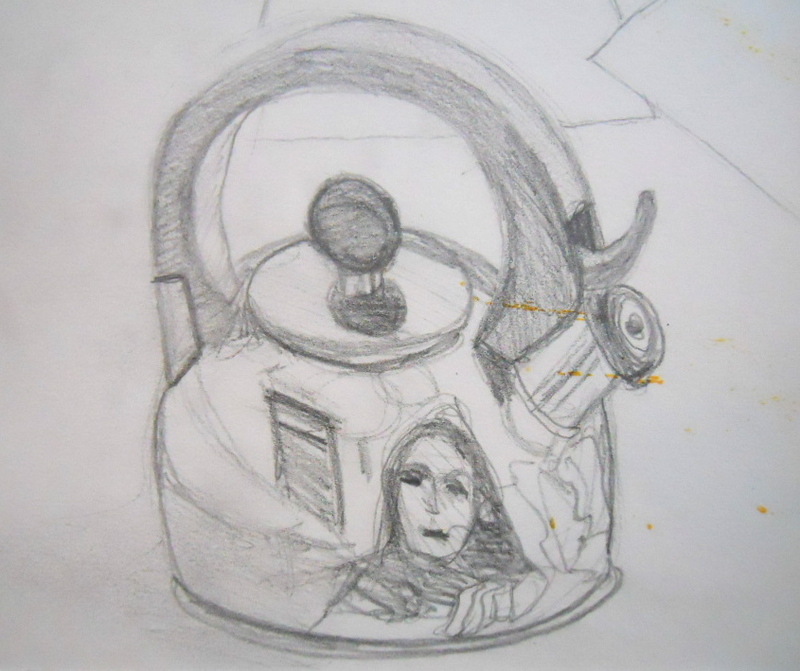 The two teapots here are a good illustration of a frustrating drawing phenomenon. 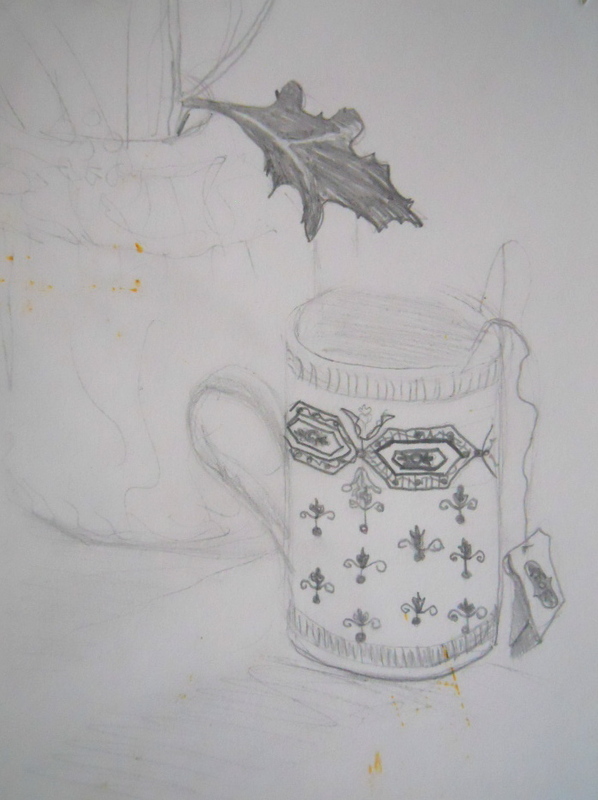 Quick sketches often have a life to them, a vibrancy that is hard to maintain in a longer more detailed drawing. You can kill the darn thing so easily, and it becomes lifeless and dull. 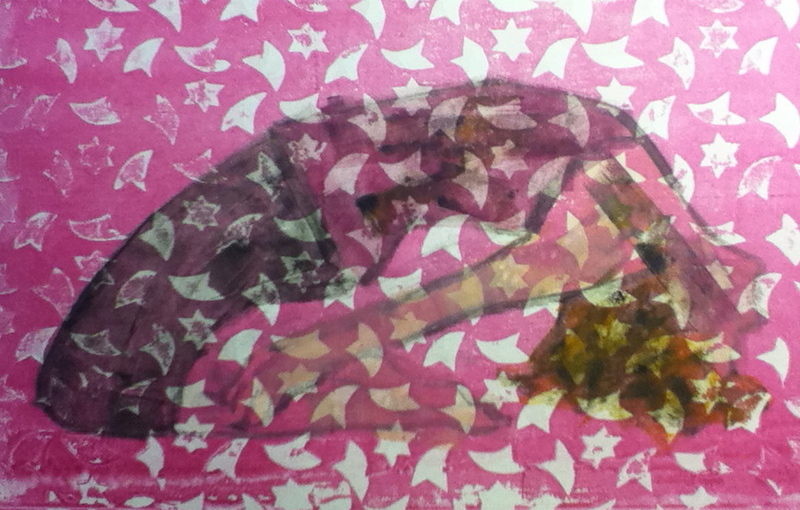 I bought some Speedball Speedy-cut and a set of lino cutters and experimented with combining stamps with gelatin printing using the pose of Ursula, a photographer herself and a dedicated ashtanga practitioner, doing Ustrasana, or camel pose. The smaller stamp from yesterday is Peg Mulqueen in laguvajrasna. Not a bad day, after all. I rolled Indian corn gently but with a little pressure over the jello. Then combined a few other things with it. I could use some different size pans to make gelatin plates in. I could also cut them down to size. So these are all Speedball inks, which come in “brown” and “yellow” instead of “burnt umber” or “hansa yellow.” I like a little more specific information about the pigments I’m using so I’m thinking of trying Golden Open acrylics, which are slower drying acrylics and which I could also use to paint with and use my good bristle brushes, which generally you can’t use with acrylics. Then there’s Daniel Smith block printing ink, which is oil based but water soluble I think?? The consistency of the Speedball inks can be a bit gummy and I wonder if that is due to filler. The annoying thing is that nothing holds the delicate nuances of pattern like the jello itself, so it’s hard to get patterns onto the stencils, and even if I do they don’t always release from the stencil. I’m sure that Linda Germain wrote about this somewhere on her blog, and next I want to try freezer paper stencils and see how that works out. After I carve a few more stamps.